The United World College [UWC] Bermuda National Committee held an Awards Ceremony earlier this summer to recognize the 2018-2020 Scholars. The ceremony was hosted by Governor John Rankin with distinguished guest, Her Majesty the Queen Noor of Jordan, President of the UWC Movement. Also in attendance were: Minister of Education Diallo Rabain; Shadow Minister of Education Cole Simmons; Minister of Government Reform Lovitta Foggo; UWC Bermuda alumni, parents, donors and recipients. UWC said they are a “global education movement that seeks to make education a force to unite people, nations and cultures for peace and a sustainable future. “Central to the ethos of UWC is the belief that education can bring together young people from all backgrounds on the basis of their shared humanity, to foster social change through courageous action, personal example and selfless leadership. “To achieve this, UWC schools and colleges all over the world deliver a challenging and transformational educational experience to a deliberately diverse group of young people, inspiring them to become agents of positive change in line with UWC’s core values. Sierra Brangman, an 53 student at The Berkeley Institute, who will be attending UWC Li Po Chun in Hong Kong. Tierrai Tull, also a student at The Berkeley Institute, who will be the first Bermudian student to attend UWC Dilijan in Armenia. Jahzara Pluck-Ming, an M5 student at Somersfield Academy, who has been placed at Mahindra United World College of India. Sebastian Lee, an M5 student at Somersfield Academy, who will be the second Bermudian to attend UWC Changshu in China. Yusef Bushara, an M5 student at Somersfield Academy, who will be attending UWC Pearson College in Canada. “The UWC Bermuda National Committee commends these outstanding students who have each demonstrated a strong academic background, commitment to community service, and embracement of the core UWC ideals. 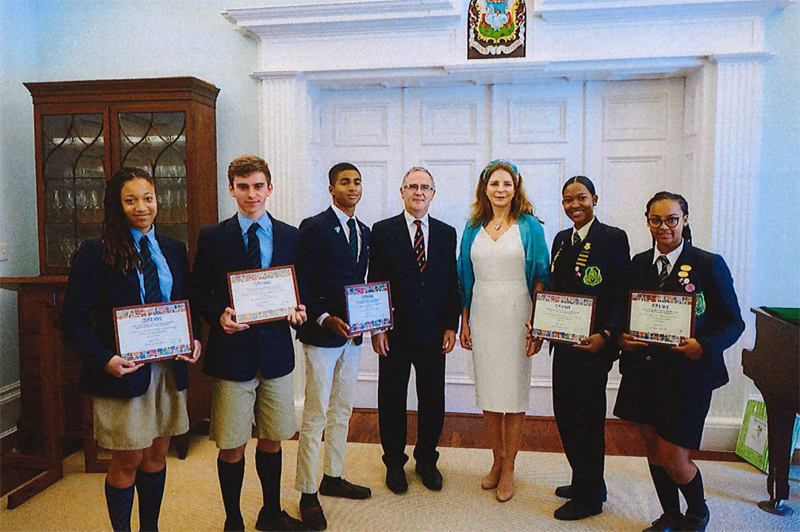 We are confident that they will represent Bermuda well as they embark upon the next phase of their educational journeys,” the organisation said. Sean Smatt, Chairman of the UWC Bermuda National Committee, noted ”Her Majesty said in her presentation at the Ocean Risk summit that human impacts have no borders. One of the core UWC principles is that selection is based upon merit, not upon financial ability. Thus, the UWC Bermuda National Committee spearheads ongoing fundraising initiatives to ensure that deserving students have the opportunity to experience this transformational educational experience. The committee also expresses its sincere appreciation to the Bank of Bermuda Foundation, other donors and local alumni for their ongoing support.